This year again, 16 of the best Counter-Strike teams battled it out in the LanXess Arena, Cologne, Germany. Once again, Smartcast covered the battle that took place underground : that of sponsoring! Below, you will find an even more refined analysis than the previous one, with improved calculation methods and more accurate samples. We would also like to thank Zestats for their collaboration. ESL chose to use a Swiss Round format. As a result, the competition’s total length amounted to 3 982 minutes (66 hours), which is 14 hours more than last year. In terms of division between in-game time and show time, the stream was also more balanced. 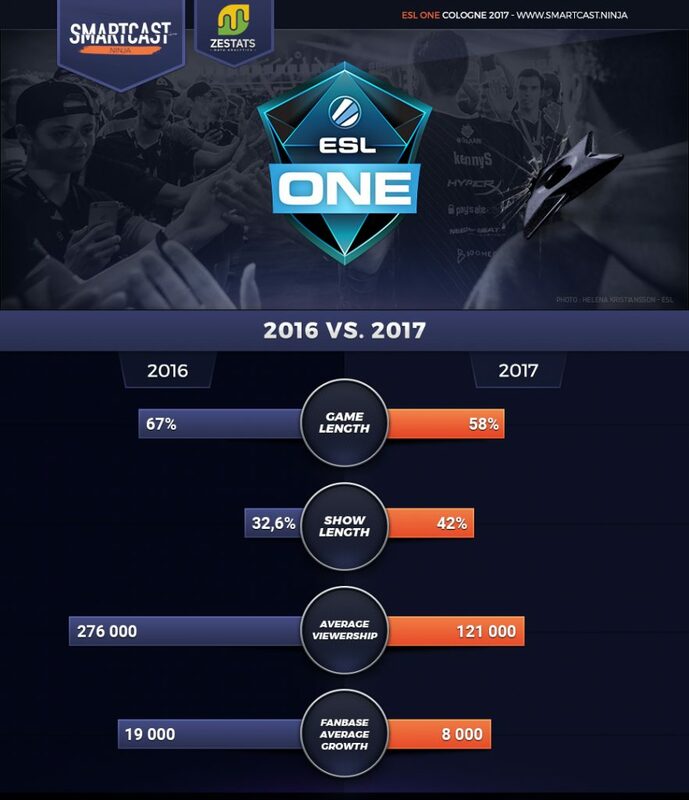 However, ESL One lacked appeal and was affected by a viewership drop : there were 276 000 average spectators in 2016 versus 121 650 in 2017. This drop had an impact on the social media drain as well, a point we will develop further on. On the players’ jerseys, there were 49 sponsoring brands. The event itself had 7 official partners. Like the previous years, some companies such as PaysafeCard, Intel or Logitech sponsored teams while being in partnership with ESL One. Overall, 51 brands were visible during the broadcast ; a stable figure compared to last year. That being said, there was a major turnover concerning the nature of the brands : this edition featured 40% of new brands compared to the last one. This figure makes sense though, as 6 new teams entered the tournament this year as well. This year, HyperX makes it a double tap. Not only is it the sponsor with the most exposure, but it also has the best brand image. Kingston’s firm made the right choices by sponsoring the champion SK Gaming but also Na’Vi, G2 and Team Liquid, which all made it through the group stage. Twitch maintain their plan to sponsor several different clubs. Their logo was displayed on 5 jerseys, making the streaming platform the second best in terms of air time exposure, with a good brand image as well. In our rankings, very few surprises are to be found. The sum of all the matches shows that the better ranked teams enjoy the most exposure as well as the better brand image. (Beware though : our calculation method was altered, and the data cannot be compared to that of last year). In average, a brand sponsors 1.4 teams. Twitch leads the number race with 5 teams, followed by HyperX (4 teams) and DXRacer (3 teams). 58% of air time was devoted to matches, 24% to desk analysis and 18% to advertisement. Thanks to a more sober and simple desk, the brands and sponsors can benefit from a better exposure. However, one could argue that some teams’ jerseys are overfilled with sponsors. What was the impact of the tournament on clubs? Quite obviously, the two finalists gained a large quantity of new fans. 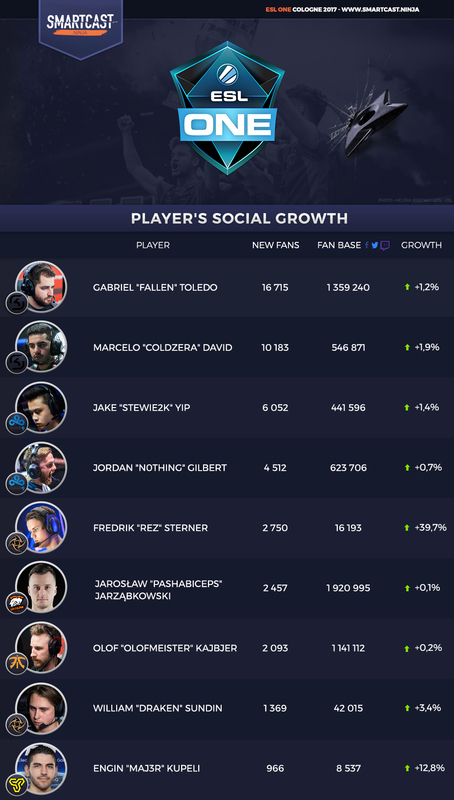 SK Gaming and Cloud 9 respectively gained 1.9% and 1.7% of fanbase growth, which is a meaningful addition for brands that already have a million followers each. The data also allows us to spot good performances. For instance, Turkish team Space Soldiers gained 4,85% of followers by upsetting SK Gaming in the group stage. However, there is a huge gap between the gain of new fans between 2016 and 2017. For example, OpTic Gaming had earned 70 500 new fans in 2016, while the record for 2017 belongs to Cloud 9 with ‘only’ 24 444 new followers. The average followers gain amounted to 19 000 new fans last year, but only amounts to 8 300 fans this year. 7 brands were featured as partners of ESL One this year. 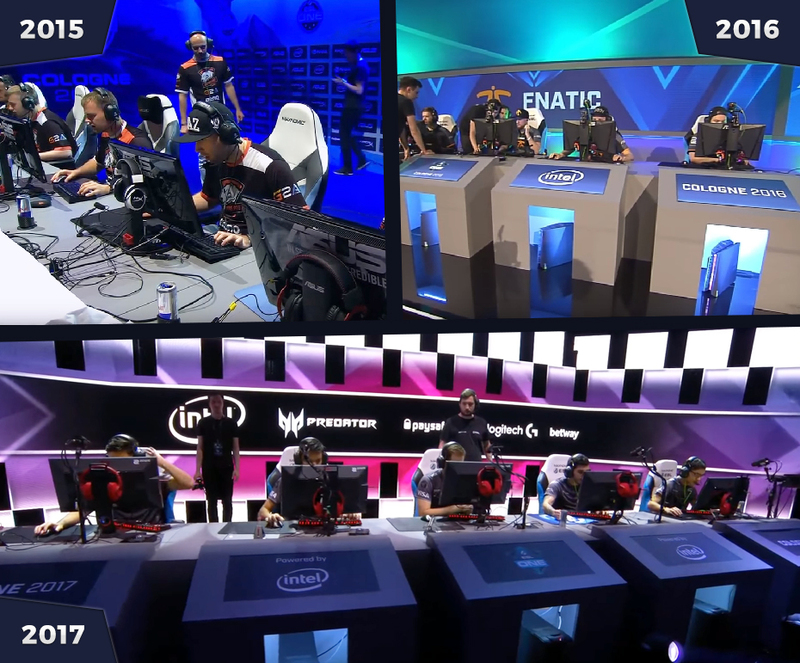 A distinction can be made between suppliers such as Zowie and Need For Seat, which provide the players with equipment, and other partners like Intel and Logitech, which support the event in exchange for visibility (displayed logos, commercials…). Partners were displayed during the whole event, be it in the games or at the desk. For Intel (seen for 1 244 minutes) or Predator (seen for 870 minutes), it was a great exposure. As usual, ESL ran a giveaway, a lottery that allows viewers to win prizes by following the partners’ social media accounts. As a result, Betway’s community doubled in size thanks to the event’s visibility (from 45 500 to 91 120 fans). Intel won this battle with a 2 898 534 followers gain, but their performance has to be put into perspective. Indeed, such a gain is probably due to a media buying ongoing during the event. Finally, Paysafecard lost 1220 followers, which is both very peculiar and hard to explain. As far as players are concerned, Gabriel ‘FalleN’ Toledo was the most successful. The tournament MVP and back-to-back champion won the heart of 16 715 new fans who followed him on social media. It represents a 1.25% growth for the Brazilian sniper, who is already a Counter-Strike superstar. For NIP rookie Frederik ‘REZ’ Sterner, it was the first step on the big scene against international players. The young Swede’s outstanding performance granted him no less than 2 750 new followers and a 39,7% growth. For the 35 Twitter accounts we analyzed, the players gained 2 200 new followers in average. Though ESL clearly tries to improve many aspects of their show and to come up with new concepts, appeal still went downwards for this year’s ESL One. Losing the ‘major’ status definitely took its toll. In addition to a higher cash prize and to the support of the publisher (Valve), Major Tournaments also feature skin giveaways, which have a tremendous impact on the audience. It’s a data that is easy to check : the viewers peak during the ESL One finals (Cloud 9 vs. SK Gaming, 343 000 viewers) was already reached during the Krakow Major… during the group stage. 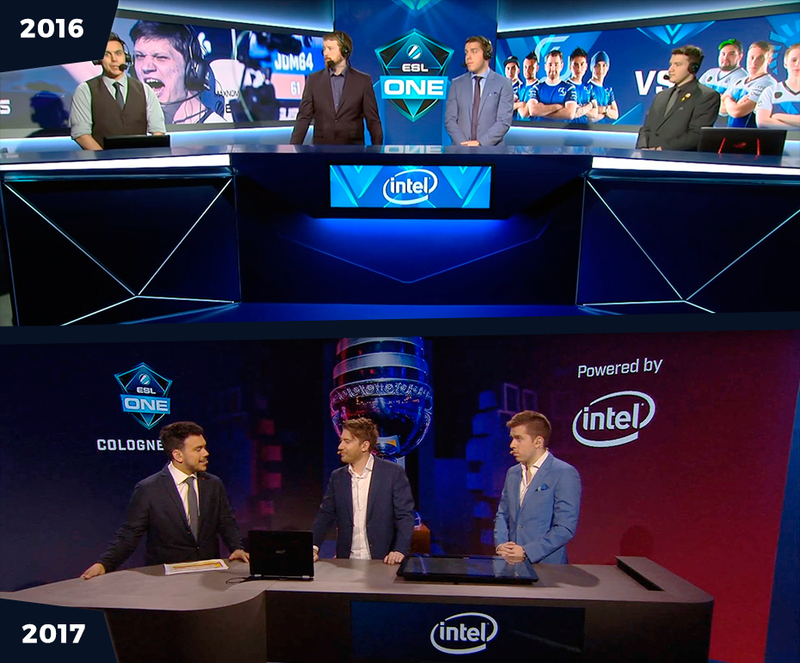 This should encourage ESL to come up with new ideas if the company still wants to attract major clubs and sponsors. But even though the displayed brands underwent a turnover, 60% of the sponsors were already represented last year. This accounts for a great stability in a sector that is still fully growing. Special thanks : Robin Allard, Quentin Missault, Hugo Brionne and the Zestats team.